I absolutely crazily head-over-heels love the band Steeleye Span. To summarize, if you don’t have the time to peruse a lengthy Wikipedia entry on a band you’ve never heard of, Steeleye Span is a band that peaked in the mid- to late-70’s with a crazy-awesome mix of electronic 70’s pop, steel drums, and English folk ballads about like fairies and robbers and witches and Robin Hood. If you’ve never heard them, don’t worry. YouTube has a decent selection of Steeleye Span hits, and I have provided a crash course in my favorite band for you below. READ ON. Beautiful, ethereal, otherworldly, sort of medieval and elfin. Right? Isn’t that kind of the picture in your head when you hear her sing? WELL IT’S NOT TRUE. Sort of how we pictured Maddy. So she does her set, she’s great, we applaud, but we’re crazy impatient for the main act, and then out walks . . . Even though like twelve years have passed, I can still describe her outfit head to toe. A black gauzy Stevie Nicks blouse. A silver lame skirt with a weird handkerchief hem. Orange tights. Black pointy witch boots. And a silver-and-orange scarf. She looked like someone’s crazy aunt, the one you never want to go out in public with because she wears cat sweatshirts un-ironically. Cat and I were CRUSHED. As the months and years went by, we eventually got over it (and actually the concert was awesome, and we met her afterwards, and she was delightful, and signed a CD for Cat and a poster for me, and I still adore her), and I eventually realized (long, long before the advent of Susan Boyle) how shallow and superficial it was to be sad that my favorite singer wasn’t pretty. But still, there’s a tiny part of me that felt betrayed that she didn’t look like the people she was singing about, and another part of me that felt guilty for being that shallow. Yeah. 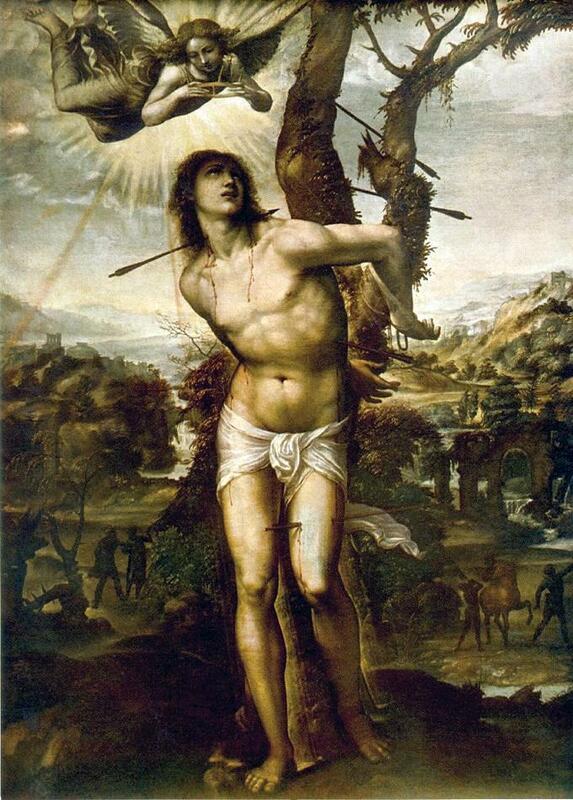 That would be Saint Sebastian, of whom I have never seen a not-grisly picture. Welcome to my childhood, ye Methodists and Presbyterians with your “Precious Moments” figurines and your altar crosses WITHOUT bleeding Jesuses on them (say whaaaa???) and your sunshiney hymns about walking in gardens with the Lord! We Catholic children were raised on BLOOD. That’s just how we roll. When we get Communion we’re eating Jesus’ FLESH, people. If we don’t raise our children with constant, daily exposure to horrifying and unbelievably distressing pictures of violently martyred saints, will it ever fully sink in for them that the iconic visual representation of our faith is a primitive early Roman torture device? How else are they gonna learn? LESSON #1: If your parents don’t like your boyfriend, it’s likely he will somehow wind up dead. (See “The Victory,” “Lady Diamond”) In “The Victory,” a young woman’s parents don’t like her boyfriend because he’s poor, so they arrange for a press gang to forcibly conscript him into service on a ship during the Napoleonic Wars. The ship is called called the Victory, and if you are an English history nerd like me you know that won’t end well, because the Victory was the ship of Admiral Lord Nelson and even though he led the British to victory over the French, he and his crew pretty much all got killed. Thanks, Mom and Dad! And “Lady Diamond” is even more gruesome. The first time I heard it, it made me physically queasy. It’s a beautiful, creepy, haunting song that gives me nightmares. I really wish I could find the video, but it’s not to be, so I’m just linking to the lyrics HERE. The moral of the story is that if your parents are rich and/or your dad is a king, and you want to marry a scrappy lower-class lad, you have just put a death sentence on his head. For the love of God just marry the boring rich old prince your dad wants you to marry, and stop the madness! LESSON #2: Women are unusually prone to revenge. (See “The Black Freighter,” “Alison Gross,” “Dance With Me”) In “Dance With Me,” a young guy is riding along when the elf king’s daughter sees him and asks him to dance with her. He’s not interested, because he’s a nice guy, and even though she’s smoking hot, he’s not interested seeing as how it’s, you know, HIS WEDDING DAY. Her response is “Do you refuse to dance with me? A plague of death shall follow thee.” NICE. But the all time classic of the Steeleye Span Revenge-of-a-Wronged-Woman genre, BY FAR, is the twisted sicko awesomeness that is “Alison Gross.” Many people I know with only a passing acquaintance with Steeleye Span know “Alison Gross.” And instead of describing with you, I’m just going to PLEAD with you to watch this video. It is . . . indescribable. You’re welcome. That will be haunting your nightmares for DAYS. LESSON #3: War has consequences. (See “Let Her Go Down,” “The Victory,” “Fighting For Strangers,” “Dark-Eyed Sailor”) Considering that Steeleye Span hit their peak in the 60’s and 70’s, it’s hardly surprising that they’re so clearly pacifists. But because the songs are historical – i.e. they’re not singing about Vietnam – they feel contemporary even now, and they deal with timeless themes, like what happens to wives and mothers when their men are at war. In “Dark-Eyed Sailor,” a man comes home from sea and confronts his love – who doesn’t recognize him and thinks he’s been dead for years – to see if she’s been faithful. P.S. With most of these videos, I just cared about the quality of the sound, and unless they were a live recording I just assumed the visuals were irrelevant. But this one, I happened to notice, has some RAD unicorn/fairy pictures, including one that appears to be a unicorn watching the Aurora Borealis, which I’m pretty sure I’ve seen on a hideous t-shirt. So, enjoy. See? Cute, right? There aren’t many good pictures of Justin – but if you’ve seen the movie you know what I mean. And if you haven’t seen the movie . . . HOW IS THAT POSSIBLE? Now, unrelated to any greater theme, I’m just going to plunk in some videos for other favorite Steeleye Span songs I think you should definitely listen to. “Thomas the Rhymer,” a very old English ballad about a man kidnapped by a fairy queen. “Tam Lin,” one of my favorite fairy tales, about a young girl who rescues her lover from the clutches of an evil fairy queen. (Evil fairy queens are a major stylistic feature in Steeleye Span songs, and thus in my childhood daydreams as well.) One of my favorite books in high school was a modernized retelling of this story by Pamela Dean (check it out HERE). “Boys of Bedlam,” a creepy haunting ballad about an insane asylum. And, the best for last – the song that started it all . . . the awesomely crazy 1975 video for “All Around My Hat,” my favorite song from about the age of two onwards. (Maddy actually looks pretty good here. I DESPERATELY covet that wackadoo yellow dress.) My mother sang this song while chopping vegetables, sweeping the floor, and working in the yard. She loved it. As much as I love crazy Maddy Prior’s lilting, clean, vibrato-free, angelic voice, every time I listen to this song I hear my mom clattering around in the pantry and hunting for canned tomatoes, idly planning out a dinner recipe and unconsciously humming to herself. Now it’s the song I sing when I’m chopping vegetables or sweeping the floor, and if I have kids I’ll make sure to screw them up permanently with exposure to Steeleye Span early and often, filling their heads with bloody and racy English folklore, so that when they chop vegetables and sweep the floor, they too will sing “All Around My Hat” under their breath without even knowing they’re doing it. It’s the least I can do. This entry was posted in Personal and tagged Mom, Music, My Childhood, Writers That Give Me Goosebumps. Bookmark the permalink. Actually, the third line of “Let Her Go Down” is “swim for your children, swim for your wives.” And it’s not that we thought these songs were that good for you as a kid; it’s just that we were totally into SS about the time you were starting to pay attention to music.